Orchids are such elegant and exotic beauties, highly prized, cultured and grown worldwide! And it’s definitely unsurprising that they’re treasured in our tropical garden, ranking topmost as our favorite flowers! We’ve been growing orchids for more than 36 years now…ahem…that’s as long as our marriage! ;) Our favorites are the dendrobium phalaenopsis and vandas as they’re not only very affordable, easy growing and low maintenance, but a sight to behold! Just look at this image of dendrobiums below to get an idea! Plant type: Indoor or outdoor flowering plant, native to South East Asia and Australia. Light: These are warm growing orchids, thus require moderate to high light. Locate in semi-shade areas with preference to morning sun, though never under direct sun which will scorch the leaves. Moisture: Regular watering as roots should be moist when plant is in active growth. When watering, water thoroughly – best to immerse orchid pot in a pail of water until no more air bubbles appear. Moderate humidity is required too. Soil: Potting medium should be open and coarse. Fir bark mixtures are best, with reasonable chunks of bark, perlite and charcoal. Alternatively, use broken pieces of terra cotta or clay pots with a mixture of charcoal or coconut husk or sphagnum moss. Propagation: By dividing the older stems (even leafless ones) or old pseudobulbs that will then generate new plantlets, probably two or three from each stem as seen in left image. 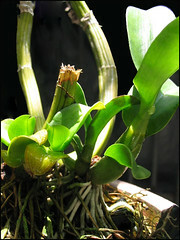 This is characteristic of Dendrobiums phalaenopsis which usually develop new growth from its bulblike base and even produce plantlets (like air plants) at the top tip of older canes. Best time to divide and multiply is when the plant outgrows the pot or when the canes start growing out over the edge of the pot! Break the pot with a hammer, divide the canes with a sharp knife into 1-3 canes per division, remove rotted roots if any and repot. As for the air plants with its aerial roots, remove by snipping about 2 inches of the supporting cane below it and pot in orchid medium. So, do not throw or trim off your leafless canes that are still alive unless shriveled and dead because it may surprise you yet with a spray of blooms or new young shoots! Dollars saved here for home gardeners! Features: These stunning epiphytic orchids are so called Dendrobium phalaenopsis orchids due to its strong resemblance between their flowers and those of the phalaenopsis (Moth Orchid). A vigorous growing plant reaching a height of less than a meter with bright green ovate leaves which are held on canes that usually become top heavy as it ages. Each spray holding 3-20 gorgeous blooms will sprout from the upper leaf axils. There may be more than one spray on each cane. Flower colors range in varying shades of white, pink, magenta, yellow, orange, chartreuse and others. You’ll be blown over with such a magnitude of dendrobium colors! Care: Check this useful dendrobium culture notes on healthy growth that leads to abundant flowering, prepared by the Canadian Orchid Congress. Do explore too Toptropicals.com for other orchid varieties and culture information. Another pleasant educative read on orchids, if you’re interested. You may want to enjoy seeing more dendrobium pictures at Toptropicals.com and an orchid photo library at The Orchid Photo Page. Updated on Sept 1, 2007 – Some recent dendrobium pictures from our garden here! I bought a Dendrobium burana stripe number 1 about 6 years ago, it hasn’t flowered in years! But the leaved are still alive…what can I do to get it to flower? thanks for any info, and great site! I’m no orchid expert, just sharing from experience – Dendrobium phalaenopsis needs adequate moisture, humidity, sufficient sunlight and good air movement, plus a fortnightly feed of a balanced fertilizer for best plant growth, leading to flowering. We’re diligent with these care requirements and leave the rest to nature and our blessed tropical hot and wet climate which suits it perfectly. Some flowers more than the others, but as long as they’re healthy with green leaves and rather fat canes, we’re happy and hopeful. I just wanted to know if I’ve destroyed my orchid by dead heading it down to the base of the stalk. Will my orchid ever bloom again? Thank you! I am so relieved that they’re OK. I love Orchids so much! My boyfriend got me a beautiful D. Burana Jade plant from hawaii for my birthday. I live in Colorado, which i know is not the wet, hot tropical climate this beautiful plant is used to. I was wondering if there were any tricks to help her think she is still in a tropical climate, and not be affected by the major lack of warmth and humidity. Thank you for your time and consideration. You just need to mimic its natural habitat for best growth, that is providing sufficient bright light/sunlight, humidity and water, as well as fertilize it fortnightly. Do check out the links I have provided above under the sub-item ‘Care’ to assist you. All the best! I HAVE A YOUNG BURANA PINK WITH TWO SPIKES. I HAVE BEEN TOLD BY ORCHID EXPERT THAT DIFFERENT DEN. NEED TEMPS COOL, MEDIUM AND WARM TEMPS. I HAVE ALSO BEEN TOLD THAT THEY HAVE LIGHT REQUIREMENTS. THIS IS ALL LEADING UP TO WHAT DOES MY DEN. BURANA PINK NEED REGARDS TO TEMP. AND LIGHT. ONE MORE QUESTION. THE GREEN HOUSE THAT I BOUGHT IT FROM IN HAWAII SAYS IT WILL BLOOM AT LEAST 4 TIMES A YEAR AND IS VERY PROLIFIC SO IT MIGHT BLOOM MORE TIMES AS IT AGES ????????? THIS IS NOT MY FIRST TIME GROWING ORCHIDS SO BE AS SPECFIC AS YOU CAN. THANK YOU SO MUCH FOR ANY INFO ON THIS BEAUTIFUL ORCHID.